A major progressive activist group and a major union issue endorsements of the insurgent Democratic contender. Candidates seek election-season endorsements for a lot of reasons. Endorsements by groups with substantial membership bases, and with a capacity to turn out those members for favored candidates, have the obvious potential to shape election results. But there’s more to it than that. Endorsements can legitimize political upstarts. Endorsements can solidify the positions of front-runners. And endorsements can give a boost to a candidate at a critical stage in the process. Backers of Vermont Senator Bernie Sanders, who is fighting to catch up with former secretary of state Hillary Clinton in the critical first-caucus state of Iowa, and who is fighting to maintain a narrow lead in the critical first-primary state of New Hampshire, say he got just such a boost Thursday when a pair of major endorsements were announced. Within minutes of one another, the progressive activist group Democracy for America and the Communications Workers of America union both backed the senator in the race for the Democratic nomination. DFA, which was started by backers of former Vermont Governor Howard Dean’s 2004 presidential bid, has grown into a well-regarded grassroots political and issue-advocacy organization with active groups in states across the country and a track record of backing progressive candidates at the local, state and federal levels. Early in the 2016 race, the group urged Massachusetts Senator Elizabeth Warren to seek the Democratic nomination. This month, it conducted a national poll of members that concluded December 15. Sanders won 87.9 percent of the 271,527 votes cast in a contest where an endorsement could only be secured with a super-majority (66.67 percent or more) of all the votes cast. Clinton (who is backed by Howard Dean) took 10.3 percent, while 1.1. percent backed Maryland Governor Martin O’Malley. The level of support for Sanders was unprecedented. When the 11-year-old group held a similar vote on whether to endorse in the 2008 presidential race, no candidate cleared the super-majority hurdle. 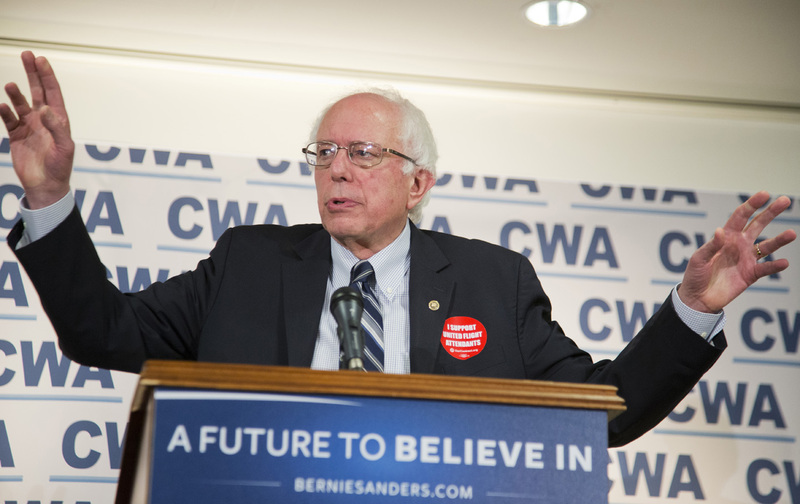 87.9 percent of Democracy for America members voted for Sanders in a national poll. DFA activists will join Sanders backers from groups such as the Working Families Party, Progressive Democrats of America, Democratic Socialists of America, Friends of the Earth Action, and a pair of key unions: National Nurses United and the American Postal Workers Union. Most major unions that have issued endorsements are backing Clinton, however, including the powerful National Education Association, the American Federation of Teachers and the American Federation of State, County and Municipal Employees. The former secretary of state, who has a solid lead in national polls, has attracted a number of new union endorsements in recent weeks. In late November, for instance, the Laborers’ International Union of North America endorsed her, as did the Service Employees International Union. “Hillary Clinton has proven she will fight, deliver and win for working families,” said Mary Kay Henry, the international president of SEIU, which in the 2008 primary season backed Barack Obama over Clinton. The CWA endorsement followed a three-month process that included hundreds of meetings with union members in their workplaces and an online endorsement survey that CWA officials say attracted tens of thousands of votes. “Bernie Sanders stands with working families against corporate greed. "—Chris Shelton announcing CWA endorsement.